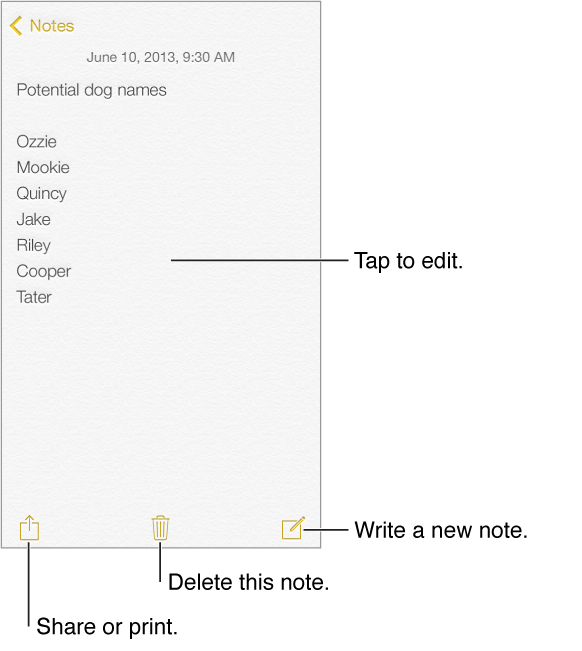 See your notes on your other devices. If you use an icloud.com, me.com, or mac.com email address for iCloud, go to Settings > iCloud and turn on Notes. If you use Gmail or another IMAP account for iCloud, go to Settings > Mail, Contacts, Calendars and turn on Notes for the account. Your notes appear on all your other iOS devices and Mac computers that use the same Apple ID. Share or print. Tap at the bottom of the note. You can share via Messages, Mail, or AirDrop (iPhone 5 or later).